The first few minutes of Death Metal Angola don’t feel like the introduction to a documentary. They’re something more akin to the opening sequence of a horror film. We’re presented with a quick lesson on Angola’s history in the 20th century—the 15-year war its people fought to regain their independence from Portugal (ending in 1975), the ensuing civil strife that erupted immediately thereafter (lasting until 2002), and a full tally of the death and suffering both conflicts inflicted upon its inhabitants as well as the land. A voiceover tells us a ghost story that frankly could be made into its own creepy stand-alone feature. All is shot in shadow. We half expect a sunken-eyed wraith to pop out and steal the breath from us. Somewhere lodged in that preamble is a brief sequence of a young man jamming on an electric guitar, picking out cruelly melodic riffs through a tiny amplifier as he growls into a microphone. That could be construed as a means of setting the mood, but Death Metal Angola’s actual tone is hopeful rather than nihilistic. This is not a picture about the specters and shades that haunt a corner of the world purged by bloodshed. Rather, it examines how the survivors of those atrocities find common cause through music. You may have figured the musical genre from the title—and if you’re not the metal type, you may also choose to pass the film over. You shouldn’t. Death Metal Angola does more than paint a portrait of hardship for its viewers, or lecture us on regional devastation that isn’t glamorous enough to make the evening news. Its primary concern is the power of art to bring people together, and to give them a filter for their emotions, their struggles, their misfortunes. Death metal seems the genre that’s least likely to uplift listeners; it’s angry, aggressive, an archetype that could literally be described as sound and fury—and that’s exactly the point. Why death metal? Why Africa? Director Jeremy Xido gives us context and background in controlled doses, fixating on a primary through line about the efforts of two residents in the city of Huambo—Wilker Flores and Sonia Ferreira—to kickstart a rock concert in their area, for locals as well as residents of nearby burgs like Benguela and Luanda (Angola’s capital). Ferreira is Xido’s protagonist, a maternal, kind-hearted and incredibly courageous woman who runs an orphanage populated by 55 boys bereft of their families; she gains a 56th child halfway through the film. Ferreira has resolve in spades, and a lot of love for both her young wards and Flores. She talks at length about the awful things she has witnessed in her lifetime, and we sit and marvel that she has managed to keep herself from unraveling. To hear it from the death metal maestros Xido interviews throughout the film, though, the very music itself gives Angolans strength. How does a sound born in Norway and Sweden, and influenced by the chord progressions of classical music, make its way down to the Southern coast of Africa? This is less clear, but it hardly matters: death metal, we’re told, also comes from Angola, and is heard in the percussive force of the music’s drumming. In that respect, death metal—most often referred to here merely as “rock”—is a global persuasion that gives the young people of Angola an outlet for dealing with the destruction that has shaped their entire lives. 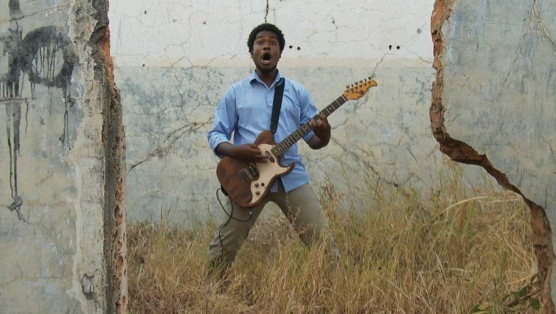 Death Metal Angola starts as a brooding national crisis doc and ends as a concert film. The transition is remarkably seamless, and by the time Xido’s narrative draws to a close, you will have been moved well past the grotesqueries shared in its introduction. Music is a force for unity—forceful music, perhaps even more so.